Recovery and Empowerment Program Participants Share Their Experience. Chris York – I feel a lot better about myself. I learned a lot about myself. Everything is very helpful and very relevant so that when my next relationship comes around I will be a lot more successful. I learned why I was so utterly out of my mind and why we couldn’t get along. The group process helps a lot more than one on one. You learn where you are and most important where you want to be. Mike Schreiber – When you are emotionally abandoned by the one single person you’ve built your life around you need support. The Beyond Divorce class provides the forum to gain insight and support that is useful in shoring up what remains and teaching about how to survive. Kevin Hatland – I thought I had to suffer through the divorce experience all by myself. I’m so glad I found this class. I feel I’ve healed so much of the pain and confusion in this short class. I feel interested in life and new experiences again! Thanks! 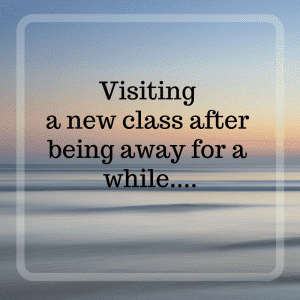 Jim G. – After the class I finally felt hopeful and less of a victim. Bill “Ghostdog36C” Torrie – You can grow if you consciously embrace this leadership evolution. Sindy W. – This class saved me. I was so lost and so sad when this started. I didn’t think I would survive the pain. I am literally in such a better place. I will be forever grateful. Thank you! Margot S. – There are some really wonderful people in this group. I’m so glad I joined up and grateful you coaxed me through the concerns I had. Everything we’re doing, and the people involved, have been immensely helpful. The book, the exercises, what we do in class and how you direct each process is so thoughtfully laid out and presented. Shannon L. – I am so crazy busy but some day I hope to be able to volunteer as a mentor for one of your classes. Spending time with my groups – especially the first class was life changing. I don’t know how I would ever have managed without your guidance, and the protective arms of my companions. That was way back in 2009! Teri A. Who would have though that divorce would have so many hidden blessings! I went to the Beyond divorce class last night and had a horrible restless night. Their pain was heartbreaking. I Can’t hardly believe I feel this good in just 8 months! I hope they all sign up and will be in the place where I am in 8 months. I love you all. Dane S. – Wow, the anguish of the entering class is really amazing. You remember what it was like, but you don’t remember – seeing it again is quite the eye opener… each time. It’s good to know they will be so much better off in a couple months. Greg H. – It was surprising how quickly I began to look forward to the class. Building community with people who are in a similar place: the ability to meet people who truly understand where you are—as experts in pain. I found a lot of safety in opening up to these people. Cher Ferrell: I was skeptical that a divorce group could help me and I’m happy to say I was proved wrong. 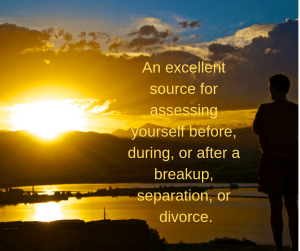 I learned so much about myself and my relationship, that knowledge has helped ease the heartache inherent in the divorce process. I’m tremendously grateful to have found Jeannine and this class. Laurie Oliver – This was an incredible experience. Jeannine’s sense of purpose is enlightening. She has such a sense of peace that one can’t help but be engulfed with that sense of well being. Paul Black – I was unsure about this, especially opening up to a group of strangers. I am truly happy that I came, and opening up was really helpful. Everyone had a common reason for coming, but such different experiences. It was a great way to learn and grow together and work on the recovery process. D. S. previous class participant – I was in the midst of my divorce last year at this time, and I was a total basket case. I was also extremely skeptical that this class could help, and I wasn’t really comfortable with this sort of thing. Nonetheless, I took this class last year. It was extremely helpful and I wouldn’t give it up for anything. There are many reasons why and how the class works. I encourage you to take the class if you’re struggling at all. (Margaret) Gretel Pauly – This class really helped me to be able to move forward in a more confident and positive way. It gave me a better way of thinking, not being so negative, and to know there’s a better life out there waiting for me. Andre Bollaert – A safe place to share all of the difficult parts of the process. I have learned so many tools to move forward, heal, learn. It helped me learn how to love both the good and bad about myself. This is something that has been transformational for me. 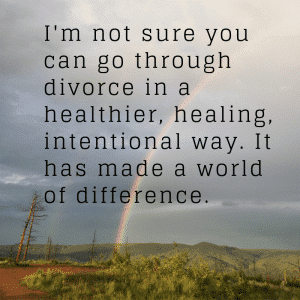 Mary Anne DeWitt – I’m not sure you can go through divorce in a healthier, healing, intentional way. It has made a world of difference. David Fiske – Take it! Anything that helps you through the feelings and process is a good thing. Linda Gutenkunst – The groundlessness of divorce is horrid. It is an ending of the life you’ve known. But this class will save your soul, make you let go of the sadness and hurt that needs help to go, and find a start in a new life. I was so glad to have found this class. Jessica Deines – I liked being able to define all the emotions that you go through in a divorce and being able to mark them off after I worked through/accepted the emotion. Jill Hunter – Wonderful experience both from a growth perspective and trying to understand what to do in my marriage. I have found life-long friends in the group, Jeannine and the assistants. Diane Lomonaco – I came into this class believing that people didn’t care and nothing would help my shattered life. Now I believe in my future more than the past, and know I have the skills to embrace that fully. George Garry – Great to feel so much love and support from a variety of people. Great to get the feedback on learning to create the life I want to, and can, create. Robert MacKinnon – I believe that this is not an ending but is also a new beginning. I believe I will be in relationship again and I owe it to my future relationship to be as baggage free as possible. John Hernandez – Accepting/understanding how I can change in positive ways to improve myself. Just learning about all the emotions a person goes thru during divorce. Sharing, sharing, sharing with everyone your personal feelings and how similar we are all in this area. We are “NOT” alone. Juan Perez – I very much appreciated hearing the women’s point of view on many topics. That has truly helped me to adjust and learn what needs tweaking for successful relationships. I learned that I am OK and not to believe all the negative criticism. “Jeannine, you have created such a wonderful course by taking the Fisher program and updating it..no pun intended…a much needed revitalization of a recovery and wisdom process for those going through divorce and rentry into the world of dating.” -Christina H.
Jon Spencer – The class participants were a great group of men and women who were all interested in moving forward with their lives and who provided a source of encouragment and support during a challenging period. Elizabeth Wiig – I love the structure and tools that this class has given me to further my understanding of what happened in my ex-love relationship. I use this new knowledge constantly in all of my relationships and have found so much clarity and value in this. Tim Crist – I found class to be incredibly beneficial because you realize you aren’t the only person going through divorce and that your situation isn’t that much different than others. Jon Eady – The class forced me to face some issues in my situation that were not on the surface. Shining light on them helped my overall outlook and emotional stability. It cleared away some non-productive clutter so I could start building a more solid foundation. Erin Dunn – I absolutely began to be comfortable in my own skin. I’m a 40-year old woman, and probably haven’t felt that comfort since I was ten years old. Thirty years!! Not only did Jeannine and the group help me gain some understanding and closure with my marriage, but also (and more importantly) how to love myself. I will be eternally grateful for what this group has brought to my life. Kellie Bayne – This experience has been exactly what I needed. I was a lost soul when I met Jeannine and her helpers at the [Divorce] Expo. I have come a long way due to this class. Thank you for all you’ve given me. 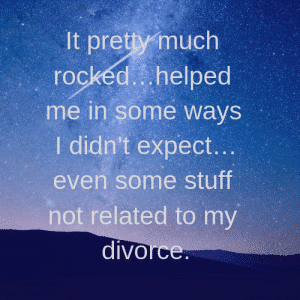 Nate – It pretty much rocked…helped me in some ways I didn’t expect…even some stuff not related to my divorce. Pete Byrne – The best part of the class is that you get a social network of people that understand what you are going through. To say that divorce is difficult is an overwhelming understatement. The support group is huge. Karen Isaac – I feel like I would be lost in space if I had not landed here when I did. It has been a meaningful and invaluable experience for me that I hope to continue the process for my health and well-being. Lauren – I wouldn’t trade it for anything. Perfect timing in my life. You have a wonderful spirit, Jeannine. Bob – This course provided me with the realization that my vast range of emotions were not unique – others experience the same dealings with the same intensity. The support provided by the group was wonderful. Erin Shockey – The class was very helpful in many ways. I didn’t think I was as hurt as I was, but after going through the class I feel so much more free. 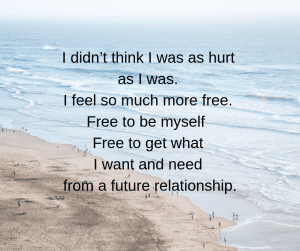 Free to be myself & free to get what I want & need from a future relationship. Heather – This course was a great foundation builder for me and I am changing and growing as a result of my divorce I appreciated the perspective it gave me and all the support available in dealing with all these challenges. Katy Vincent – The class helped me through the process of going through my divorce. When I started the class I was a couple of months separated, and I should be divorced next month. I found each week I learned something that helped me. The support from the group was critical in my recovery. I would highly recommend this class. From Facebook: Shaun wrote: “Wow. It has been two years since my Divorce Recovery class. What a difference both time and perspective make. I would like to give a shout out to Jeannine Lee for the amazing work that you do. For any that are looking for an accepting safe place to heal and refocus post-divorce, I would strongly recommend that you explore the possibility that a group of caring people is what you need to move you beyond your current situation. Michael Welcome – This has been very helpful to me. I made a lot of friends. The various exercises and just sharing of experiences has been great. Jill Jagemann – I began the class feeling confused about what direction to take. It has provided steps to clarity & acceptance of the feelings that accompany divorce. Meeting others going through this process even if we are at different stages has provided a steady base for healing and realizing I have the ability to move forward. Peter Sutyak – I think that sharing experiences with others has been invaluable to me and has made me feel more empathetictowards others and has given me more self confidence and a view of what I need to change in a relationship and what I need to change in myself to make a relationship work and prosper. Karla Schwenn – Absolutely worth every minute, every class. Indeed – wish I would have had this sooner – But or and … I have this now! Most important was the support, compassion and the friendship. Thank you Jeannine. Stephanie Collins – This class has been so helpful! I have identified where I am now on my post-divorce journey and have a clear path to ensure I am healthy and happy! I know that my best days are ahead of me. I appreciate you, Jeannine, for guiding us. “Fantastic!! Wonderful!! It helped me so much. I feel like the person I was before my marriage and I’m excited about my future. I wish this was national so I could refer friends and co-workers. -John D.
Alexandra Schein – “I would recommend the class to everybody who is going through a divorce/separation. Participants are supportive and understanding. It is probably the most helpful tool/community during one of your most traumatic times in your life.